Scottish Leather Group Ltd is a UK based manufacturer of leather. They have made significant investments over many years to improve the sustainability of their plants. These measures allow them to have one of the lowest carbon footprints in the EU for the production of leather. The loft was asked to create the 2016 version of the Annual Sustainability Report with the organisation wanting to highlight some of the exceptional outcomes that they had achieved in recent years. As part of the brochure project, the team created a range of infographics that each told a great mini-story about the company and what they were doing- the next step was to animate each of these infographics for individual campaigns using social media. The infographics and the animated versions, in particular, have been a great success. In the Autumn of 2013, 6 Chartered Accountants decided to take the plunge and open the doors of a new accountancy firm – Consilium Chartered Accountants. The company was set up to provide a ‘people-focussed’ service for Scottish businesses, and we were delighted to be given the opportunity to work with Consilium to help them create a new digital presence. We wanted to get under the skin of the ‘Consilium’ team and learn more about their staff to find out what they were really about. We found, almost in every case, an emphasis on building proper relationships with clients and a desire to know the real stories about their businesses. “Getting to know the people behind the numbers” became the theme behind the entire project. This was captured with art-directed photography of the Consilium Partners, alongside some of their clients in their own work environments. The photography was an important part of the new site, each staff member was given pride of place on the website, with their own biography so that current and future clients could really get to know ‘the people behind Consilium.’ A clean, direct and engaging website was created. The authentic, personal and open feel around the company is portrayed in their tagline, as well as the focus being on image over words; which sets them apart from their competitors. 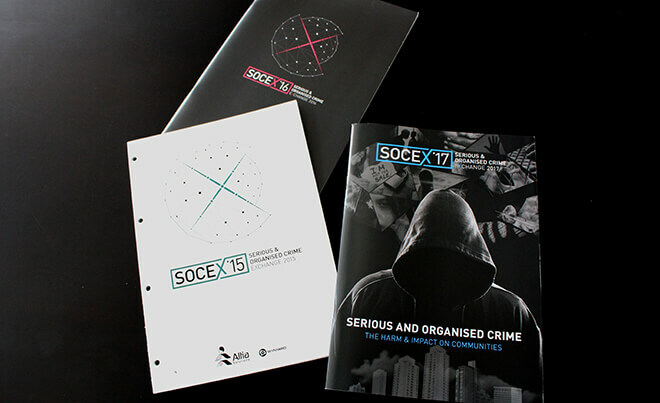 We were given the opportunity to work with the organisers of the Serious and Organised Crime Exchange (SOCEX) for the third year in a row for the design of their 2017 brochure. The organisers asked us to be extremely bold in bringing the main themes of the conference to life, ‘Harm and Impact On Communities,’ whilst continuing to build on the secondary themes of the conference. The loft team made widespread use of a hooded figure throughout the brochure to reflect the effect crime has on communities. This menacing figure makes an appearance in various guises throughout the brochure and was particularly helpful to the event organisers as it avoided the risk of stereotyping race or gender in the communications of the conference. The front cover received careful attention with the hooded figure looking over a council estate in a scene reminiscent of Dali’s painting ‘The crucifixion.’ The background of the front cover included images which reflected many of the conference’s secondary themes including ‘slavery’ and ‘governance and coercion in communities, etc.’ We carried through the ‘network’ visual identity from previous conferences into the 2017 brochure. This was complemented with vivid page backdrops – each of which brings the different sub-themes of the conference to life. 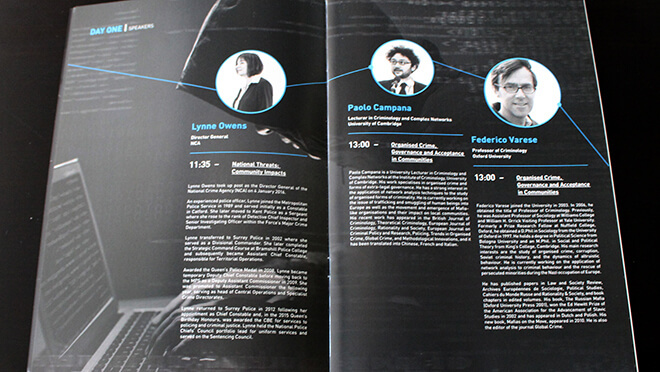 The brochure was incredibly well – received by both the client and also the delegates of the conference. Are you a commander, an executive or an advocate? Not a question we regularly ask ourselves but one that we were questioning this month. In an effort to get to know one another and ourselves better we all took part in the Myers-Brigg’s questionnaire and got up close and personal with our personality strengths and weaknesses. 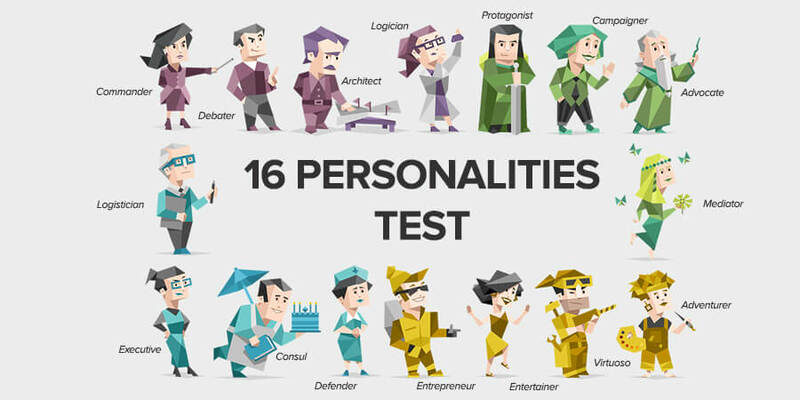 It all started with 16 Personalities — which is a great website for breaking down your personality type and puts it into layman’s terms. Be warned though, it is incredibly fascinating and has become seriously addictive, all my friends and family have now taken the test even with all their protests. Eager to find out more we invited Christine Penman into the studio to explain more about our personality types and focus on how we can work as a team even more effectively – not your usual Friday morning breakfast meeting! Starting off with a simple task to show how everyone thinks differently, we all closed our eyes and Christine said the word “horse” and then we opened our eyes and shared what we thought of. One saw a black stallion, another saw a horse in Spain and of course, thanks to my other half, I saw a horse in Hawick. Next, we broke down each personality aspect and learnt about what it means to be an introvert or extrovert, use intuition or sensing, are thinking or feelings led and whether you use judging or perceiving when tackling work. The most stand out difference is between being thinking or feelings led. In a task, we were split into our two groups and asked to write about how we deal with conflict when we are directly involved or not directly involved. For the feelings led group, we found that we tend to avoid conflict and can feel quite blind-sided by it. Whereas for the thinking led group, all the emotion is taken out of it and they like to get to the point and “explain to them 3 times why they are wrong.” All jokes aside, the full morning was great and we really did learn a lot about ourselves and each other. Being able to understand each other’s personality types and what each person brings to the team was very interesting and should enable us to work more efficiently as a team. The aftermath — having access to all this valuable information, we wanted to find a way of communicating this quickly and effectively with each other so Nicola got her design on and came up with cheat sheets for everyone. These cheat sheets take pride of place in our studio and outline our personality stats, our ‘devine’ skills and how we activate these skills in a simple but incredibly effective profile design. They have been a talking point among us and clients, giving them a quick insight into the team and all our quirks. Sometimes we can’t help but do a little self-promotion and the production of the third SOCEX Brochure is one that we are pretty damn proud of. 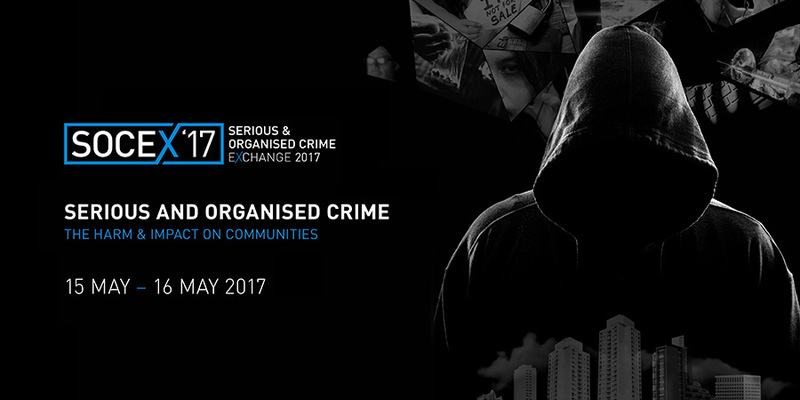 The Serious and Organised Crime Exchange is an annual meet-up of the nation’s top law enforcement chiefs to discuss the issues of the day. Previous speakers at the conference in Chesire includes the previous Home Secretary – The Rt Hon Theresa May MP. Well, this is the loft’s third year at developing the conference brochure after the design of the initial branding in 2015 and we believe this one is an absolute cracker. Previous brochures were incredibly well-received but didn’t stray visually too far from the conference branding, this year the team really got brought the conference theme ‘Organised Crime, The Harm & Impact on Communities’ to life. Keep an eye out for a full case study but key features include the wonderfully haunting hooded man looking over a British Council Estate in a composition reminiscent of Salvador Dali’s painting of ‘The Crucifixion,’ the use of a mosaic pattern bringing the other conference themes to life within the visual style of the SOCEX theme and finally the introduction of key themes as backdrops to each of the speakers of the day. In terms of concept and execution, a huge step forward from previous efforts, and a testament to the huge amount of work put in by the team. They really did sweat every single detail. Already looking forward to finding out the themes for the 2018 event. Creative work, family photo, laptop, coffee, books, plant, pens, pencils, tablet and of course your new creative family! At the loft, we have the perfect space for creatives to come and make their own. 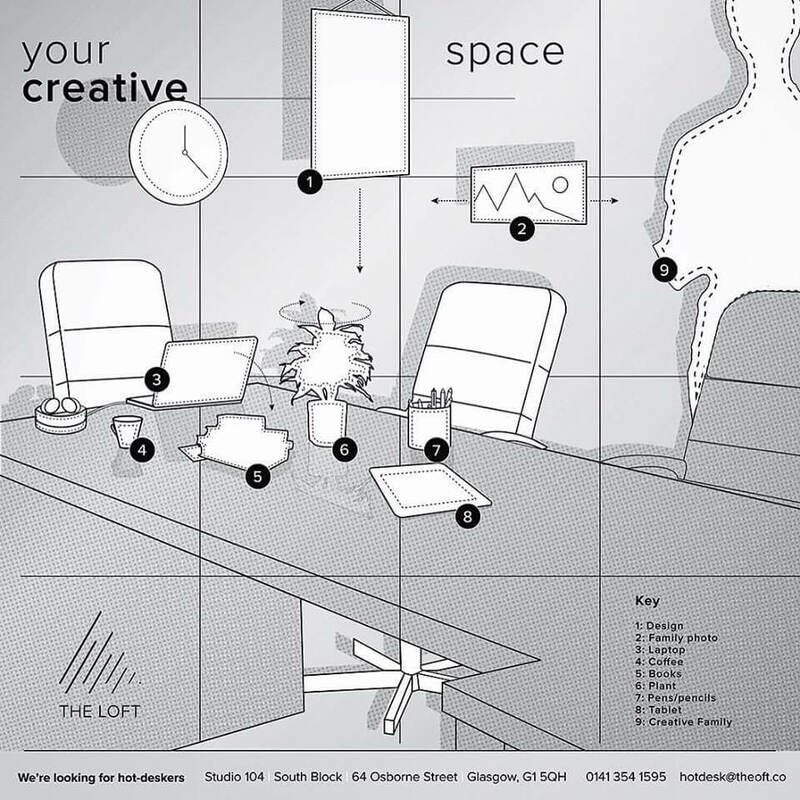 If you are fed up working from home and want to join us in our amazing South Block studio – fire us a line at hotdesk@theloft.co or call us on 0141 354 1595.